by John H. Twomey, Ph.D. Retiring To, Not From is an ideal resource for anyone who has thought about pursuing a simpler life, a life in which one has more control over basic necessities, a life in which one has more contact with the natural world. In this work John Twomey gives the reader a detailed account of what takes place on his farm throughout the year. 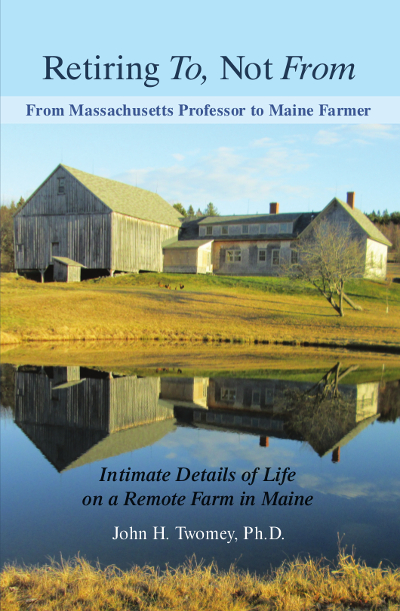 He includes extensive information regarding raising and preserving vegetables and fruits; raising chickens and brook trout; managing fields, woodlands, ponds, and brushy areas for the benefit of wildlife; as well as enjoying beautiful Maine winters. Twomey’s insightful observations on the many benefits of this rural lifestyle are both moving and thought-provoking. After 37 years as a professor at the University of Massachusetts Dartmouth, John retired in 2009 and moved, with his partner Leigh, to Montville, Maine. There they live simply and deliberately on the farm that John has owned since 1978. Having seen farms sold and developed near his childhood homes in Connecticut and Massachusetts, Twomey plans to permanently protect his Montville farm.